An Electron booster stands on the launchpad at Rocket Lab's site on New Zealand's Mahia Peninsula ahead of a planned June 26, 2018, liftoff. The launch was called off because of a technical issue. Update for June 28: Rocket Lab announced today that "It's Business Time" will not launch during the planned 14-day launch window (June 22–July 6) due to an issue with the Electron rocket's motor controller. The company has not yet announced a new launch window at this time. Rocket Lab's Electron small-satellite launcher will have to wait a bit longer to take to the skies on its first commercial flight. 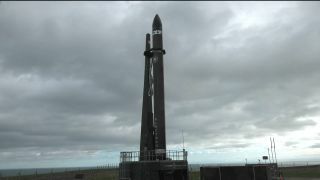 The 57-foot-tall (17 meters) Electron rocket was scheduled to lift off today (June 26) from Rocket Lab's New Zealand launch site, during a 4-hour window that opened at 8:30 p.m. EDT (0030 GMT and 12:30 p.m. local time on June 27). But Rocket Lab called off the launch at about 9:45 p.m. EDT (0145 GMT), citing a technical issue with a key engine part. "The team has identified an issue with the motor controller, so we're scrubbing for the day to review data. Stay tuned for updates!" Rocket Lab representatives wrote via Twitter today. This problem has cropped up before. The Electron was originally supposed to lift off between April 20 and May 3, but California-based Rocket Lab pushed things back to investigate "unusual behavior" in a motor controller during launch prep. Another attempt on June 22 was foiled by a tracking-system problem, and bad weather forced further delays until today's try. The Electron, which is designed to loft small satellites relatively cheaply and efficiently, has two launches under its belt. On its maiden flight in May 2017, dubbed "It's a Test," the rocket flew naked, lofting no payloads. An Electron successfully delivered four Earth-observing satellites to orbit on the booster's second-ever mission, "Still Testing," which occurred on Jan. 21 of this year. Rocket Lab calls the upcoming mission "It's Business Time."